I saw Avenue Q on Broadway in 2005 and loved it. But a few years have passed and I forgot the reasons that made it great. Viewing it at its new home at New World Stages (where it opened last night) made me remember, and grateful that this show got its second chance. Taking place in New York, Avenue Q follows humans and Sesame Street-like puppets both struggling in their careers and love lives and trying to figure out where and how they belong. Life lessons are featured, just like in Sesame Street, but it’s an R-rated version of the PBS series. It’s raunchy, but not distasteful. It’s actually delightful. And nothing is lost in the off-Broadway transition. Is Avenue Q funny? Heck yeah, it is! But in order for it to succeed as a well-rounded musical, it also has to connect with the audience on a deeper emotional level. It takes a while into the first act to hear Avenue Q’s heart begin to beat, but the moment does come, as do some surprisingly tender ones. The fantastic Anika Larsen draws a heartbreaking performance out of Kate Monster after she is jilted from her beau with the Act I closer “There’s A Fine, Fine Line.” And the lyrics and performances in “I Wish I Could Go Back To College” are so earnest that I had tears in my eyes. 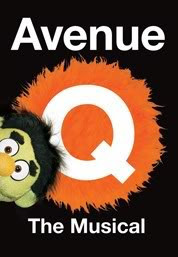 The concept of Avenue Q is as far out of the box as you can get. A musical with puppets, in which the puppeteers are in plain sight? The idea is Lion King-esque and a beautiful abstractness. Sometimes I didn’t know who to look at—the human or the puppet. But this cast is so great, I wasn’t missing out on anything by choosing to look at the human or the prop. Seth Rettberg’s eyes are just as expressive and cartoonish as his puppet counterpart, Princeton’s, and Cullen R. Titmus is such a comedian, he gives his felt friends a run for their money. Nicholas Kohn as Brian is the only blemish in the cast. For being in such a wildly fun show, Kohn certainly doesn’t appear to be having any. Perhaps he’s just bitter his character doesn’t get to have a puppet (I know I’d be). And while Robert Lopez and Jeff Marx’s lyrics are a non-stop parade of hilarious, clever jokes, the music by the two lacks quite a bit in the melody department. I can only hum two songs after leaving the theater (“Purpose” and “It’s A Fine, Fine Line”). With such brilliant lyrics, it’s too bad the notes aren’t as dazzling. 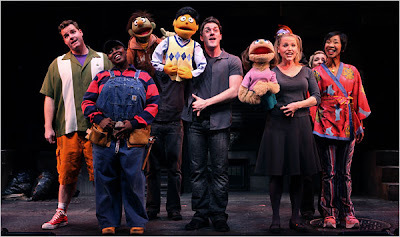 Avenue Q represents everything that makes Broadway special; creativity, fearlessness, and originality. Watching its sales decline in the weekly box office tallies in 2009, followed by the arrival of its closing notice, was depressing. Too often, the shows that take a risk are not rewarded. So in a pleasant turn of events, this musical’s new beginning is brought to you by second chances. Editor’s note: I was invited to see Avenue Q and did not rush it. There is a general rush policy in place for this show. Tickets go on when the box office opens for $26.50 each, up to two tickets per person. Seats are in the front row orchestra.